Get a jump start on your spring cleaning. PC-related gear includes more than just graphics cards, RAM, keyboards, and monitors--so we like sales on the little extras that extend the life of your system, too. 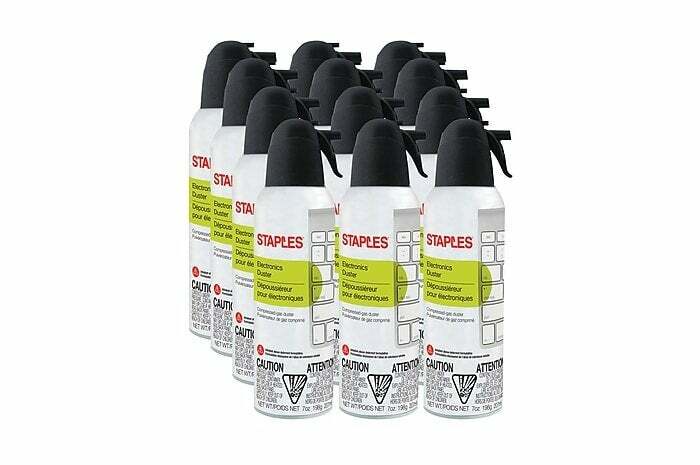 Right now, Staples has one such deal: For $40, you can get a 12-pack of seven-ounce duster cans. The office retailer usually sells these for $80, although you can find this same size container on Amazon for about $5-$6 each. Either way you look at it, this is still a pretty good deal. Compressed air may not be all that exciting, but it's a crucial tool to keep your PC humming along smoothly. All you need to do is jump on the Dusty PCs subreddit to see what can happen if you choose to ignore this important bit of maintenance. In addition to cleaning electronics, these cans include an "ethereal scent" so that your PC will have that all-day fresh smell. There isn't much else to say, really. Just be sure to use these cans in a well-ventilated area. And be prepared for the horrors that may emerge when you finally clean your keyboard at last.